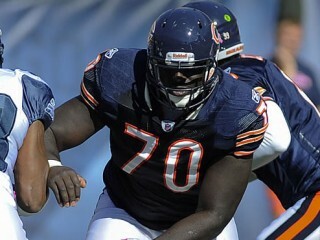 Edwin Williams is an American football guard/center for the Chicago Bears of the NFL. Entered the NFL with the Washington Redskins as a college free agent on April 30, 2009… Played in four regular season games, with two starts, in one NFL season with the Redskins. 2009 SEASON: Played in four regular season games, with two starts… Made NFL debut at Atlanta (11/8)… Started his first career game at right guard at Philadelphia (11/29). A three-year starter at center at Maryland… His 39 consecutive starts were tops on the team at the end of 2008… As a senior, a first team all-ACC selection by AP/ACSMA while starting all 13 games at center… A member of the watch list for the Rimington Trophy, honoring the best center in the nation, a consensus preseason first team All-ACC selection, a first team choice by the Sporting News, Lindy’s and Blue Ribbon and second team by Athlon… As a junior started all 13 games at center and was nominated for all-conference honors… Started all 13 games at center as a sophomore and was one of two offensive linemen to start each game… Played in each of the final 10 games of his redshirt freshman season. Two-year letter winner and starter at DeMatha, where he finished his prep career as the school’s top offensive lineman… Switched from basketball to football prior to his junior season and ultimately played offensive guard (junior season), offensive tackle and defensive end (senior season)… Earned first team All-WCAC, all-county and All-Gazette honors in 2003… Named a Mid-Atlantic all-region pick by SuperPrep and an all-region selection by PrepStar… Majored in communications and graduated in May 2008… Joined President Barack Obama and First Lady Michelle Obama at the White House Easter Egg Roll to help kids learn the value of good health during the 2010 offseason. View the full website biography of Edwin Williams.